The western population of the yellow-billed cuckoo will be protected as a threatened species under the Endangered Species Act (ESA), the U.S. Fish and Wildlife Service announced today. The Service determined that listing a distinct population segment (DPS) of the bird in portions of 12 western states, Canada and Mexico is warranted. In the U.S., the DPS will cover parts of Arizona, California, Colorado, Idaho, Nevada, New Mexico, Texas, Utah, Wyoming, Montana, Oregon and Washington. The western population of the yellow-billed cuckoo (Coccyzus americanus), an insect-eating bird found in riparian woodland habitats, winters in South America and breeds in western North America. Once abundant in the western United States, populations have declined for several decades, primarily due to the severe loss, degradation and fragmentation of its riparian habitat as a result of conversion to agriculture, dam construction, river flow management and riverbank protection. Overgrazing and invasive exotic plants have also contributed to declines. “While the major threat to yellow-billed cuckoos has been loss of riverside habitat, we do not anticipate any significant new water-related requirements as a result of this listing decision,” said Ren Lohoefener, Director of the Service’s Pacific Southwest Region. NOTE from Point Blue’s Mark Dettling: Point Blue has studied the Sacramento Valley population since 2010 and found that it was very small and continuing to decline despite robust riparian forest restoration efforts in the region. The species is already listed as endangered by the state, so I’m not sure how this might affect our work in riparian areas. For those with a deeper interest, a draft of the proposed critical habitat was released a month ago (http://www.fws.gov/sacramento/outreach/Public-Advisories/WesternYellow-BilledCuckoo/outreach_PA_Western-Yellow-Billed-Cuckoo.htm), and is still open for comment. The State of the Sierra Nevada’s Forests. High-intensity burn areas can experience runoff and erosion rates 5 to 10 times greater than low or moderate-intensity burn areas. The sediment that is carried in the runoff, not only degrades water quality and damaged infrastructure, it fills reservoirs reducing storage capacity. The 2013 Rim Fire, the largest in the recorded history of the Sierra Nevada, burned 257,000 acres, almost 40% of which was at high intensity. Estimates are that that fire produced greenhouse gas emissions comparable to 2.3 million vehicles for a year. Black tip Reef Sharks cruise Kingman Reef, part of the Pacific Remote Islands Marine National Monument. Photo by Kydd Pollock, USFWS. The Pacific Remote Islands Marine National Monument (PRIMNM)—a cluster of waters and reefs surrounding islands south and west of the main Hawaiian Island chain—will now protect an area six times its original size, making it the largest marine reserve in the world. On Sept. 25, President Barack Obama signed a proclamation to expand the existing 82,129 square mile marine reserve to 490,000 square miles, an area larger than Texas and California combined. PRIMNM surrounds the mostly uninhabited Johnston Atoll, Wake Atoll, Jarvis Islands, Kingman Reef, Palmyra Atoll and the Howland and Baker Islands. The new expansion takes the ringed area around three of the islands—Johnston Atoll, Wake Atoll and Jarvis Island—from 50 miles to the Exclusive Economic Zone boundary of 200 miles. The distance is as far as the U.S. can legally expand before the area becomes international waters. A representation of the PRIMNM expansion—green squares show the former coverage area, blue circles around Wake Atoll, Johnston Atoll and Jarvis Island indicate new expansion. Click to enlarge. Photo: Beth Pike, Marine Conservation Institute via Wikimedia. The protection of the marine reserve means that the area is off limits to all commercial resource extraction including mining and fishing, though some recreational fishing will still be allowed with permits. There are only four marine national monuments in the U.S.; all were created by Presidential Proclamation and all are in the central Pacific near Hawaii. The Pacific Remote Islands Marine National Monument was designated—along with nearby Rose Atoll Marine National Monument (13,400 square miles) further south and the Marianas Trench Marine National Monument (96,700 square miles) further west—by President Obama in 2009. George Bush designated the oldest marine national monument, Papahanaumokuakea Marine National Monument, in 2006. It protects an area of 139,800 square miles directly northwest of the main Hawaiian Island chain and is one of just two UNESCO (United Nations Educational, Scientific and Cultural Organization) World Heritage Sites in Hawaii (the other is Hawaii Volcanoes National Park). All four marine national monuments are at least partly managed by the Marine National Monuments Program under the National Oceanic and Atmospheric Administration (NOAA) and the U.S. Fish and Wildlife Service (USFWS). Only the Pacific Remote Islands Marine National Monument will be changing in size at this time…. It’s safe to assume that most presidents have big ambitions and visions of lasting Rooseveltian achievement. Though, in recent history, the millstones of Washington’s pettiness and partisanship usually grind such dreams to dust. There are exceptions, which happen when presidents discover the Antiquities Act. This is the law, used by Theodore Roosevelt and many successors, by which the executive can permanently set aside public lands from exploitation, building an environmental legacy with a simple signature and without Congress’s consent. This is how President Obama last week, in addition to everything else on his plate, created the largest marine preserve in the world. He used his Antiquities Act authority to expand the Pacific Remote Islands Marine National Monument from 87,000 square miles to nearly 500,000 square miles, a vast change. The monument is not one area but the ocean surrounding several coral-and-sand specks of United States territory that most Americans have never heard of and few will ever visit, like Wake and Johnston Atolls and Jarvis Island. The ocean there is relatively pristine and now will stay that way. Commercial fishing, seabed mining and other intrusions will not be allowed. The monument is not as large as it could have been; Mr. Obama chose not to extend its boundaries out to the full 200-mile territorial limit for all the islands within it. Still, environmental groups are uniformly praising him for going as big as he did and for defying opposition from Hawaiian fishing interests whose loyalties lie with the producers of canned tuna. That industry has other places to fish; it will not suffer. But, at a time when the world’s oceans are threatened by rampant pollution, overfishing and climate change, the benefits of Mr. Obama’s decision will be profound, particularly if other countries now follow the United States’ excellent example. Few of us will see these benefits directly. But out there beyond Honolulu, living in splendid isolation, are sharks, rays and jacks; coconut crabs; moosehorn, staghorn and brain corals; humpback and melon-headed whales; green and hawksbill turtles; bottlenose and spinner dolphins; and untold millions of boobies, curlews and plovers. All these, and countless other living things, will be better off. Republicans will complain, but they should remember that it was President George W. Bush who created the monument. Mr. Obama only expanded it. Building an environmental legacy is an idea with bipartisan appeal. Herbivores consume more non-native oak leaf material in areas with diverse native plant communities than in less diverse communities. Why diverse plant communities tend to resist invasion by non-native plants, remains uncertain. Researchers have been examining the potential role of herbivores on the invasion of non-native plant species in diverse plant communities…. In 1872, a merchant ship called the Mary Celeste set sail from New York, and four weeks later was found by sailors aboard another vessel to be moving erratically in the Atlantic Ocean 400 miles east of the Azores. Curious, those sailors boarded the Mary Celeste, only to find nary a soul. The cargo was intact, as were supplies of food and water. But there was no sign of the seven-man crew, the captain, or his wife and daughter, who had gone along for the journey. To this day, what turned that brigantine into a ghost ship remains a maritime mystery. It was with a nod to this history that when bees suddenly and mysteriously began disappearing en masse in Britain several years ago, the phenomenon came to be known there as Mary Celeste Syndrome. Beekeepers in this country were similarly plagued. Honeybees, those versatile workhorses of pollination, were vanishing by the millions. They would leave their hives in search of nectar and pollen, and somehow never find their way home. On this side of the Atlantic, though, the flight of the bees was given a more prosaic name: colony collapse disorder. What caused it remains as much of a head-scratcher as the fate of the Mary Celeste, but the serious consequences for American agriculture were clear. And thus it draws the attention of this week’s Retro Report, part of a series of video documentaries examining major news stories from the past and analyzing what has happened since. The centrality of bees to our collective well-being is hard to overstate. They pollinate dozens of crops: apples, blueberries, avocados, soybeans, strawberries, you name it. Without honeybees, almond production in California would all but disappear. The United States Department of Agriculture estimates that nearly one-third of everything that Americans eat depends on bee pollination. Billions of dollars are at stake each year for farmers, ranchers and, of course, beekeepers. …With so many theories in play, several federal agencies weighed in last year, with a joint study that effectively checked the “all of the above” box. A mélange of the various factors was behind the colonies’ devastation, the agencies’ report said, putting no more weight on one cause than on any other. While Mary Celeste Syndrome — it sounds more lyrical than colony collapse disorder, does it not? — caught everyone’s attention, it is not at the core of concerns over bees today. Colonies still die, for a variety of reasons, but there have been fewer instances of the mass collapse that caused so much anguish in 2006 and ’07. Beekeepers have replaced their dead hives. Experts interviewed by Retro Report seemed unperturbed by thoughts that honeybees were about to disappear. Rather, what worries them is a gradual, steady shrinkage of the honeybee population over the years. Two decades ago, the United States had more than three million colonies; now it is down to an estimated 2.4 million, the Agriculture Department says. And more bees seem to be dying — from all causes, not just colony collapse — in the normal course of what are referred to as the “winter loss” and the “fall dwindle.” Where annual bee losses were once in the range of 5 percent to 10 percent, they are now more on the order of 30 percent. The fear is that this dying-off is too great for the country’s ever-expanding agricultural needs. That, specialists like Dr. Pettis say, is what would really sting. Sequencing the genomes of monarch butterflies from around the world, a team of scientists has made surprising new insights into the monarch’s genetics. They identified a single gene that appears central to migration — a behavior generally regarded as complex — and another that controls pigmentation. The researchers also shed light on the evolutionary origins of the monarch…. MEXICO CITY (AP) — Experts in Mexico say deforestation is down in the forest that is the winter home of monarch butterflies and they hope to see a rebound in the annual migration after it fell to historic lows. Omar Vidal of Mexico’s World Wildlife Fund says two to three times more monarchs may arrive this year, as compared to last year. Millions of the black and orange butterflies return to a reserve area each year. Farmers who own the land have been known to cut trees for personal use. But Vidal said Wednesday there are no signs of such logging this year. Commercial logging, however, remains a threat in the area. Last year, the monarchs covered only about one-and-a-half acres (half a hectare), an area nearly 60 percent smaller than the previous year…..
More than one hundred and fifty years ago, Charles Darwin hypothesized that species could cross oceans and other vast distances on vegetation rafts, icebergs, or in the case of plant seeds, in the plumage of birds. Though many were skeptical of Darwin’s ‘jump dispersal’ idea, a new study suggests that Darwin might have been correct. The Living Planet Report is the world’s leading, science-based analysis on the health of our planet and the impact of human activity. Knowing we only have one planet, WWF believes that humanity can make better choices that translate into clear benefits for ecology, society and the economy today and in the long term. This latest edition of the Living Planet Report is not for the faint-hearted. One key point that jumps out is that the Living Planet Index (LPI), which measures more than 10,000 representative populations of mammals, birds, reptiles, amphibians and fish, has declined by 52 per cent since 1970. Put another way, in less than two human generations, population sizes of vertebrate species have dropped by half. These are the living forms that constitute the fabric of the ecosystems which sustain life on Earth – and the barometer of what we are doing to our own planet, our only home. We ignore their decline at our peril. We are using nature’s gifts as if we had more than just one Earth at our disposal. By taking more from our ecosystems and natural processes than can be replenished, we are jeopardizing our very future. Nature conservation and sustainable development go hand-in-hand. They are not only about preserving biodiversity and wild places, but just as much about safeguarding the future of humanity – our well-being, economy, food security and social stability – indeed, our very survival…. Online volunteers are being asked to classify images of penguin families to help scientists monitor the health of penguin colonies in Antarctica. Recent evidence suggests that populations of many species of penguin, such as chinstrap and Adélie, are declining fast as shrinking sea ice threatens the krill they feed on. By tagging the adults, chicks, and eggs in remote camera images Penguin Watch volunteers will help scientists to gather information about penguin behavior and breeding success, as well as teaching a computer how to count and identify individuals of different species….‘Most penguin colonies are so remote and the environment is so hostile the most practical way to study them is to leave something recording for us. Between the Australian Antarctic Division and ourselves, we have a network of over 50 automated cameras,’ said Dr Tom Hart of Oxford University’s Department of Zoology, who leads the Penguin Watch project and the organisation Penguin Lifelines (penguinlifelines.org). ‘These cameras are now giving us hundreds of thousands of images of penguins throughout the year. Because of the enormous amount of data available, we need volunteers to help us count them and eventually to ‘teach’ computer algorithms how to find and count birds accurately.”Counting penguins in images enables our team to learn more about penguin behaviours; every penguin people tag in these images will help us to extract vital information about the birds’ winter activity, the impact of predators, and the timing of breeding,’ said Caitlin Black of Oxford University’s Department of Zoology, a member of the Penguin Watch team. As they classify images, Penguin Watch volunteers can see how penguin families develop: from finding a mate and laying eggs, to raising and guarding their chicks, to preparing their offspring to weather the Antarctic winter. As part of Zooniverse (zooniverse.org), a collection of web-based citizen science projects, Penguin Watch volunteers will be able to join an online community, discuss images and natural history on the project forums, and learn more about the science they are contributing to from the Penguin Lifelines blog (penguinlifelines.wordpress.com). Geographically isolated wetlands can be connected in ways that are largely ignored, but that may be critically important for watershed storage and stabilizing downstream flows, researchers say. The connection between wetlands and federally protected waters should not be limited to those with direct surface connections, they add…Federal environmental law can be tricky business. Defining which bodies of water are protected by the federal Clean Water Act can impact the permits required for someone developing their land, especially when wetlands could be affected. Supreme Court decisions in 2001 and 2006 narrowed legal protections for geographically isolated wetlands, which are those surrounded by higher land. The new legal test created from those decisions protects wetlands and streams only when it can be proven that there is a “significant nexus” to downstream navigable waters. The legal test has created confusion because there is no consensus about what constitutes a significant nexus. A University of Florida research team, whose study is published online in the journal Water Resources Research, shows that geographically isolated wetlands can be connected in ways that are largely ignored, but that may be critically important for watershed storage and stabilizing downstream flows. The study was funded by the Environmental Protection Agency. Americans love their dogs, but they don’t always love to pick up after them. And that’s a problem. Dog feces left on the ground wash into waterways, sometimes carrying bacteria — including antibiotic-resistant strains — that can make people sick. Now scientists have developed a new genetic test to figure out how much dogs are contributing to this health concern…. Fronts, fish, and predators, just published online in Deep Sea Research Part II: Topical Studies in Oceanography. This is the first-ever special volume on fronts and biota, with an emphasis on higher trophic levels. The nine papers comprising this volume are presented trophically, covering fish larvae, bait fish, whales, squids, sablefish, tunas, and seabirds, in four oceans: Atlantic, Pacific, Indian and Southern. The full contents of this special issue can be viewed at http://www.sciencedirect.com/science/journal/09670645/107. In the region of the North Pacific known as the Sargasso Sea, circling ocean currents accumulate mats of Sargassum seaweed that shelter a surprising variety of fishes, snails, crabs, and other small animals. A recent paper shows that in 2011 and 2012 this animal community was much less diverse than it was in the early 1970s, when the last detailed studies were completed in this region. Allowing polluters to buy, sell or trade water-quality credits will reduce pollution in rivers and estuaries faster and at lower cost than requiring them to meet compliance costs on their own, a new study finds. Establishing trading markets at a river-basin scale and allowing interstate trades will yield optimal results, but regulators shouldn’t let uncertainties over details bog down a program’s launch, since trading at any scale will yield gains over no trading at all. NOTE: Point Blue scientist Nat Seavy, Ph.D. is working with our partner agencies to establish the Central Valley Habitat Exchange. The program creates financial returns for landowners striving to establish both healthy wildlife habitat and productive farming through the exchange of habitat credits. Butterflies eating food collected from cities around the Fukushima nuclear meltdown site showed higher rates of death and disease, according to a study. “Our study demonstrated that eating contaminated foods could cause serious negative effects on organisms. Such negative effects may be passed down the generations. On the bright side, eating non-contaminated food improves the negative effects, even in the next generation,” the lead author noted. In the past 600 years off the California coast, occasional episodes of diminished ocean upwelling that cause fish populations to crash have occurred naturally. The poor yearly fish harvests seen in the last 60 years aren’t any worse in severity than earlier, but are happening more frequently. The Chinese mitten crab, recorded in Scotland for the first time, poses a serious potential threat to salmon and trout in Glasgow’s River Clyde, according to researchers. The Chinese mitten crab, Eriocheir sinensis, is native to East Asia but is now found across NE Europe and the USA. The magnificent plumage of the peacock may not be quite the sacrifice to love that it appears to be, researchers have discovered. “These feathers weigh about 300g and can exceed 1.5m, so it’s expected that the male birds would be making a significant sacrifice in their flight performance for being attractive,” one researcher said. However, experiments showed that in fact, the plumage made no difference to take-off and flight of the birds. Traveling down a river always makes for a great story. But what if your river runs dry? CNN reporter John Sutter just finished kayaking — and walking — 417 miles down California’s San Joaquin River. This may be the hardest working river in the world: It runs through wondrously productive farmland, which depends on irrigation. Every drop of the river is sucked dry before it reaches the ocean. Sutter happened to be paddling the river in the middle of the most severe drought in California history, and so his project brought hopes and anxieties for the future of water into stark relief. Q. How long were you out there? A. Three weeks — 24 days, I think. So yeah, it was a long adventure. Q. Did you love the river by the time you were done, or did you hate it? A. No, I totally loved the river by the time I was done with it. I was also frustrated with it, and with some of the circumstances around it. This was a learning process for me. I started off not being very good at all at kayaking. I didn’t know all that much about the river at first. The more I knew, the more time I spent on it, the more details I learned, the more interesting it got. I was out there with a couple people who study birds, and learning funky things about bird calls. Little stuff like that, as goofy as it sounds, made me fall in love with the river and the character of it. It has a lot of life in it, even though it’s really struggling. And so when I got to the end, at the Golden Gate, I really was very much in love with the river, and that’s why I was frustrated — I knew that the water that started out in the Sierras, maybe three weeks earlier, hadn’t made that journey with me, and it should…..
Next time you are beaten down by San Francisco – the traffic, the tall buildings, the lost souls sleeping in doorways, the crowds, the never-ending roar of the city – think of this: We live in one of the most amazing places in the world. If you head 30 miles from the center of San Francisco in one direction you end up in the outskirts of Novato, in another direction you are in Concord. Both are nice places if you like suburban life. But go 30 miles west and you are in a little-known wilderness, the waters of the Pacific Ocean. This is the Gulf of the Farallones National Marine Sanctuary, nearly 1,300 square miles of salt water and sea floor. …. …As crews demolish the 10,000-foot-long steel structure where the birds roost, they’ve had to navigate around broadly interpreted state and federal environmental laws designed to protect the feathered critters. “We are not going to argue with the law — the issue is often the interpretation of it,” said Randy Rentschler, spokesman for the Bay Area Toll Authority, which is overseeing the tear-down. “And the fact is, the bridge construction has suffered tens of millions of cost overruns and months of delays as these (enforcement) agencies have interpreted the regulations,” Rentschler said. The bird-friendly moves include Caltrans spending $709,000 to build 2½-foot-wide nesting “condos” on the underside of the new bridge, in the hopes that the 800 or so state-protected cormorants would move off the old span. An additional $1 million has been spent to try to lure the birds over to the new bridge, using bird decoys, cormorant recordings and even nests made from discarded Christmas wreaths. But the birds haven’t budged, prompting Caltrans to draw up Plan B — speeding up the demolition in the hopes of beating next spring’s nesting season because, once the birds start laying eggs, the work has to stop. The cost of the speedup: an additional $12.5 million. As part of that effort, Caltrans has also put nets over part of the old span to keep the birds away. It even stationed a truck with an extended boom on the old bridge to help remove some of the vacated bird nests. What’s more, to comply with its federal permit, Caltrans agreed to send any displaced chicks and eggs to the International Bird Rescue center in Fairfield for foster care until the birds are old enough to be released…..
ITHACA, N.Y. – Many birders enjoy playing an imaginary game with one another: “Blindfold me and place me anywhere in the world – I bet I can identify where I am, as long as you let me hear the birds.” This phenomenon exists because most birds are finely tuned to a narrow place on Earth. Every species has developed traits that permit it to cope with the challenges and capitalize on the opportunities of habitat in every biome, whether it’s the windswept Arctic tundra, the Antarctic ice sheets, the fog-shrouded mountaintops or the world’s driest scrubs. From giant ostriches to tiny bee hummingbirds, their ability to populate land and sea the world over is a testament to nearly 200 million years of evolutionary adaptation since diverging from the dinosaurs. But these remarkable specializations have a huge down side from the birds’ point of view. When the rules of a place begin to change, the survival and reproductive success of its birds decline. If the changes persist, one by one, birds may disappear altogether. The most specialized species are the first to go – the “indicator species” that allow us to measure an ecosystem’s overall health. More than any other group of organisms, birds stimulate both sides of our brain with their bewildering diversities in song, color, display, flight style and migratory stamina. On the one hand, because they are accessible models of basic biological principles, they are subjects of our drive to deduce the laws of nature through science. On the other hand, they are featured in centuries of humanist art and poetry because they evoke our emotions, connecting us spiritually with nature. Both of these calls on our consciousness are vital in their roles as beacons of environmental health. For millions of years, habitats have shifted naturally as landmasses move and climates fluctuate. However, never in Earth’s history have they changed as rapidly as they are changing today. The consequences on bird populations are devastating. Worldwide, BirdLife International estimates that one-eighth of all bird species are threatened, reflecting the health of their habitats. These threatened species continue to sing, but their songs aren’t poetic or musical – they are alarm songs. These declining bird populations are sending us big, flashing warning signs about the quality of our own lives. In the United States, one distinctive community of specialists, including the bobolink, eastern and western meadowlark, grasshopper sparrow and upland sandpiper, has been sending us winged warnings for the past three decades. As croplands across the middle of North America convert from family farms into horizon-to-horizon crops boosted by pesticides and fertilizers, birds that once sang from fence posts and utility poles are becoming scarce or disappearing altogether…. It’s the month of October and time to think about those spooky, creepy crawly things. What do you know about tarantulas in California? Which of the following statements are true? (c.) Tarantulas are usually nocturnal although males will venture out in the daylight in search of females during breeding season. 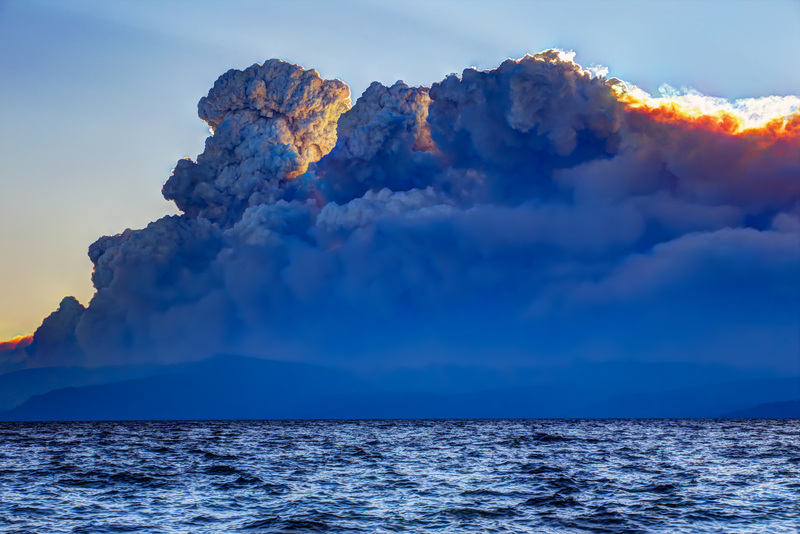 •Three independent studies, which examined Pacific sea surface temperatures and atmospheric anomalies, did not find conclusive evidence for the impact of human-caused climate change on the ongoing rainfall deficit in California. One paper found evidence that atmospheric pressure patterns increased due to human causes, but the influence on the California drought remains uncertain. •In examining pre-industrial and modern-day Colorado rainfall events, a study using a single model found that the probability of another extreme 5-day rainfall, like the one that caused widespread flooding in Boulder, is estimated to have decreased because of human-caused climate change. However, the study notes that additional research using more models is needed. •2013 U.S. seasonal precipitation extremes are primarily attributed to natural variability but with some evidence for human influences on the climate having increased the likelihood of such extremes. •A blizzard that struck South Dakota in October was unusually strong for early autumn, but not unprecedented in terms of atmospheric pressure. But there is evidence at present to suggest early autumn extreme snowfall events in western South Dakota are less likely to occur as a result of human-caused climate change…. Arctic sea ice coverage continued its below-average trend this year as the ice declined to its annual minimum on Sept. 17, according to new research. Global emissions of greenhouse gases jumped 2.3 percent in 2013 to record levels, scientists reported Sunday, in the latest indication that the world remains far off track in its efforts to control global warming. The emissions growth last year was a bit slower than the average growth rate of 2.5 percent over the past decade, and much of the dip was caused by an economic slowdown in China, which is the world’s single largest source of emissions. It may take an additional year or two to know if China has turned a corner toward slower emissions growth, or if the runaway pace of recent years will resume. In the United States, emissions rose 2.9 percent, after declining in recent years…. The greens and blues of the ocean color from NASA satellite data have provided new insights into how climate and ecosystem processes affect the growth cycles of phytoplankton — microscopic aquatic plants important for fish populations and Earth’s carbon cycle….Over the past few years, Behrenfeld has collaborated with Emmanuel Boss at the University of Maine, Orono; David Siegel at the University of California, Santa Barbara; and Scott Doney at Woods Hole Oceanographic Institute, Woods Hole, Massachusetts, to develop a new theoretical framework for explaining phytoplankton blooms, which they call the “Disturbance-Recovery Hypothesis.” According to this view, blooms can be started by any process that disturbs the natural balance between phytoplankton and their predators. A disturbance may involve deep mixing of the surface ocean by storms, bringing up deep ocean water along coasts (known as coastal upwelling), a river flowing into the ocean or even an intentional disturbance such as fertilizing ocean ecosystems with iron. The new study is focused on the second part of the hypothesis — how plankton ecosystems recover once they have been disturbed. …”Understanding the plankton ecosystem and how it responds to variability is very important for preparing and looking forward to how Earth’s system changes,” said Behrenfeld. “The environmental conditions that start and then sustain phytoplankton blooms are, in many cases, the same environmental factors that are impacted by climate change.” The next steps are to understand how species succession impacts bloom development and to learn how the carbon dioxide taken up by phytoplankton is processed within plankton ecosystems and then transferred and stored in the deep ocean. These advances are critical for understanding how changes in phytoplankton blooms translate to impacts on fisheries and climate. These challenging goals will require a greater integration of satellite, modeling and field studies. Climate change is a fact, and most of the warming is caused by human activity. The Arctic is now so warm that the extent of sea ice has decreased by about 30 percent in summer and in winter, sea ice is getting thinner. New research has shown that sea ice removes carbon dioxide from the atmosphere. If Arctic sea ice is reduced, we may therefore be facing an increase of atmospheric concentration of carbon dioxide, researchers warn. As climate change grips the Arctic, how much carbon is leaving its thawing soil and adding to Earth’s greenhouse effect? The question has long been debated by scientists. A new study conducted as part of NASA’s Carbon in Arctic Reservoirs Vulnerability Experiment (CARVE) shows just how much work still needs to be done to reach a conclusion on this and other basic questions about the region where global warming is hitting hardest….Scientists urgently want to understand the state of Arctic carbon because there are huge stores of carbon from dead vegetation locked in permafrost — and permafrost is turning out not to be as permanently frozen as its name implies. With the Arctic warming much faster than the rest of the planet, permafrost is thawing. Those carbon stores could be released into the atmosphere either slowly or in a giant burst, further accelerating the pace of climate change. “We’re opening Pandora’s box by warming the permafrost,” Fisher said. “In the Amazon, if you cut down a tree and release carbon to the atmosphere, you can plant another tree that will reabsorb that lost carbon. In the Arctic, the carbon stored in permafrost represents millennia of accumulated dead vegetation. If you lose that carbon to the atmosphere, you can’t get it back that easily.” But more carbon dioxide in the air and longer growing seasons due to global warming promote more plant growth, and plants remove carbon from the air during photosynthesis. Some models suggest that the carbon removed by plants could balance the carbon released by permafrost thaw. That’s one of the questions that CARVE principal investigator Charles Miller of JPL hopes the campaign will help modelers to answer. “Ultimately, we hope the CARVE data can be used to diagnose the strengths and weaknesses of different models and to improve the representation of carbon cycling in Alaska and throughout the Arctic,” Miller said. The latest sea-level-height data from the NASA/European Ocean Surface Topography Mission (OSTM)/Jason-2 satellite mission show a pair of eastward-moving waves of higher sea level, known as Kelvin waves, in the Pacific Ocean — the third such pair of waves this year. Now crossing the central and eastern equatorial Pacific, these warm waves appear as the large area of higher-than-normal sea surface heights (warmer-than-normal ocean temperatures) hugging the equator between 120 degrees west and the International Dateline. The Kelvin waves are traveling eastward and should arrive off Ecuador in late September and early October. A series of larger atmospheric “west wind bursts” from February through May 2014 triggered an earlier series of Kelvin waves that raised hopes of a significant El Niño event. Just as the warming of the eastern equatorial Pacific by these waves dissipated, damping expectations for an El Niño this year, these latest Kelvin waves have appeared, resuscitating hopes for a late arrival of the event. The new image is online at: http://www.jpl.nasa.gov/images/earth/elnino/earth20140922-full.jpg For an overview of 2014’s El Niño prospects and Kelvin waves, please see: http://science.nasa.gov/science-news/science-at-nasa/2014/19may_elnino/ Climatologist Bill Patzert of NASA’s Jet Propulsion Laboratory, Pasadena, California, says it’s too early to know for sure, but he would not be surprised if the latest Kelvin waves are the “last hurrah” for this much-hoped-for El Niño. “Since February 2014, the prospect of an El Niño has waxed and waned. This late in the season, the best we can expect is a weak to moderate event. What comes next is not yet clear. But for the drought-plagued American West, the possibility of a badly needed drenching is fading,” said Patzert…. Changes in Earth’s gravity field resulting from loss of ice from West Antarctica between November 2009 and June 2012 (mE = 10–12 s–2). A combination of data from ESA’s GOCE mission and NASA’s Grace satellites shows the ‘vertical gravity gradient change’. See full animation at http://www.esa.int/spaceinvideos/Videos/2014/09/GOCE_senses_changing_gravity. Although not designed to map changes in Earth’s gravity over time, ESA’s GOCE satellite has shown that the ice lost from West Antarctica over the last few years has left its signature. More than doubling its planned life in orbit, GOCE spent four years measuring Earth’s gravity in unprecedented detail. Researchers have found that the decrease in the mass of ice during this period was mirrored in GOCE’s measurements…Remarkably, they found that the decrease in the mass of ice during this period was mirrored in GOCE’s measurements, even though the mission was not designed to detect changes over time….They have found that that the loss of ice from West Antarctica between 2009 and 2012 caused a dip in the gravity field over the region. When scientists talk about the consequences of climate change, it can mean more than how we human beings will be impacted by higher temperatures, rising seas and serious storms. Plants and trees are also feeling the change, but they can’t move out of the way. Researchers have developed a new tool to overcome a major challenge of predicting how organisms may respond to climate change…. Increasingly local adaptation to climate is being studied at the molecular level by identifying which genes control climate adaptation and how these vary between individuals. This type of modeling of variation in genetic makeup represents an important advance in understanding how climate change may impact biodiversity. “We’ve developed the techniques to associate genetic variation to climate and to map where individuals may and may not be pre-adapted to climates expected in the future,” said Fitzpatrick. “It’s important to know where these places are. This gives us a way to link climate responses more closely to the biology than we were able to do previously.” The study, “Ecological genomics meets community-level modeling of biodiversity: mapping the genomic landscape of current and future environmental adaptation,” was published by Matthew Fitzpatrick of the University of Maryland Center for Environmental Science and Steven Keller of the University of Vermont. It appeared in the October 1 issue of Ecology Letters. A symbol of the danger of climate change, but in the Western Hudson Bay, scientists have found that our understanding of climate change may not be as simple as it seemed. Video Credit By Joshua Davis and Michael Kirby Smith on Publish Date September 22, 2014. LA PÉROUSE BAY, Manitoba — The sea ice here on the western shore of Hudson Bay breaks up each summer and leaves the polar bears swimming for shore. The image of forlorn bears on small rafts of ice has become a symbol of the dangers of climate change. And for good reason. A warming planet means less ice coverage of the Arctic Sea, leaving the bears with less time and less ice for hunting seals. They depend on seals for their survival. But the polar bears here have discovered a new menu option. They eat snow geese. Because the ice is melting earlier, the bears come on shore earlier, and the timing turns out to be fortunate for them. As a strange side-effect of climate change, polar bears here now often arrive in the midst of a large snow goose summer breeding ground before the geese have hatched and fledged. And with 75,000 pairs of snow geese on the Cape Churchill peninsula — the result of a continuing goose population explosion — there is an abundant new supply of food for the bears. What’s good for the bears, however, has been devastating to the plants and the landscape, with the geese turning large swaths of tundra into barren mud. Nor does it mean that the bears are going to be O.K. in the long run. What is clear is that this long-popular fall destination for polar bear tourism has become a case study in how climate change collides with other environmental changes at the local level and plays out in a blend of domino effects, trade-offs and offsets. The goose population, Dr. Rockwell said, was once limited in size by its sparse winter food supply in southern states. After many of the marshes were drained for various kinds of development, “the snow geese just sort of said, well, wait a minute, what was that green stuff just north of here? And it turns out those are the rice prairies,” he said. Having found the rice farther north in Louisiana, the geese continued to explore and expand their winter range, finding the vast agricultural fields of the Midwest. “So a species that was once in part limited by winter habitat now has an infinite winter supply of food, and that includes the best agricultural products: corn, wheat, soybeans, canola, rapeseed, all of that,” Dr. Rockwell said. Some snow geese now winter in Nebraska and Iowa where these crops are grown. But they keep coming to the sub-Arctic and the Arctic in the summer, following ancient habit. During Dr. Rockwell’s time here, the colony increased from 2,500 pairs to 75,000, and the birds moved as far as 20 miles inland as they ruined areas near the coast because of their eating habits. Snow geese graze, eating the tops of plants, and grub, pulling out plants by the roots. They have a serrated beak and a powerful neck, which means they are better able to grip and rip than their Canada geese cousins. But geese not only eat. They are eaten. Many creatures love the eggs and goslings in particular — arctic foxes, sandhill cranes, gulls and, as it happens, polar bears…. The conventional view is that over all, polar bears are “food-deprived” in the summer because there is just not enough food on land to make a significant contribution to their diet. But the snow geese may have changed that, at least here…..
Environmental scientists are being urged to broaden the advice they give on global climate change, say experts who are also frustrated that decision makers are not taking enough action. Writing in the journal Nature Climate Change, The University of Manchester researchers argue that scientists are expressing a strong desire to fix the problems highlighted by their studies into human-induced climate change…..”We are grateful that environmental scientists alert us to the impact that people are having on our planet like shifting climatic zones and rising sea levels. Emissions produced by human activity have caused annual monsoon rainfall to decline over the past 50 years, a study suggests. In the second half of the 20th century, the levels of rain recorded during the Northern Hemisphere’s summer monsoon fell by as much as 10 per cent, researchers say. Changes to global rainfall patterns can have serious consequences for human health and agriculture…. Bent and tossed by the wind, a field of soybean plants presents a challenge for an Asian lady beetle on the hunt for aphids. But what if the air — and the soybeans — were still? Rising temperatures and shifting precipitation patterns may get the lion’s share of our climate change attention, but predators may want to give some thought to wind, according to a University of Wisconsin Madison zoologist’s study, which is among the first to demonstrate the way “global stilling” may alter predator-prey relationships. “There are all sorts of other things that are changing in the environment that affect animals and plants and their interactions,” says Brandon Barton, a UW-Madison postdoctoral researcher. “My students and I were standing out in a cornfield one day as big gusts of wind came by, and the corn stalks were bending almost double. From the perspective of an animal living in the corn, we thought, ‘That’s got to have a big effect. '” Wind speeds in the Midwest are expected to decline as much as 15 percent during the 21st century. Earth’s poles are warming faster than the equator, robbing the atmosphere of some of the temperature differential that creates wind. And the trend across the American landscape is to put up barriers to the wind in the form of buildings and more natural structures. “In North America, we’ve been replanting trees that were lost in the 1800s, after settlers showed up and just leveled places like New England,” Barton says. That’s good news for hungry lady beetles, according to research Barton published in the September issue of the journal Ecology. Lady beetles eat a major soybean pest, the soybean aphid. Barton grew plots of soybeans in alfalfa fields, protecting some with wind blocks and leaving others in the open…..
SAVOY, Ill. — From afar, the three young men tramping through a corn field here looked like Midwestern farm boys checking their crop. And a fine crop it seemed to be, with plump ears hanging off vibrant green stalks. But as they edged deeper into the field, the men — actually young scientists, not farmers — pointed to streaked, yellowing leaves on some of the corn plants. “You’re definitely seeing some damage,” said Tiago Tomaz, a biochemist from Australia. The injured leaves signaled trouble down the road, and not just for a single plot of corn a few miles from the main campus of the University of Illinois. By design, the scientists were studying the type of damage that could put a serious dent in the food supply on a warming planet. ….Earlier this year, for instance, researchers at Harvard and elsewhere pooled data from the Illinois project with findings from scientists in three other countries. In a high-profile paper, the experts reported that crops grown in environments designed to mimic future conditions have serious deficiencies of certain nutrients, compared with crops of today. The Illinois researchers are trying to move past just documenting the potential trouble, though. The bigger question is: What can be done to make crops more resilient? That has lately become an urgent topic. For decades, many climate experts were relatively sanguine on the issue, thinking that warming in frigid northern countries would benefit crops, helping to offset likely production losses in the tropics. Moreover, some research suggested potentially huge crop gains from a sort of counterintuitive ace in the hole: the very increase in carbon dioxide that is causing the planet to warm…. The full results of this summer’s labors will not be known for months. But already, it is obvious to the scientists that some varieties of corn resist ozone better than others. Similarly, they have found varieties of soybeans that grow especially well in high carbon dioxide levels. And they are starting to ask similar questions about plants like tomatoes, peas and strawberries that are consumed more directly as food. (Most corn and soybeans become food for farm animals.) The preliminary findings suggest a strategy for securing the food supply. If the researchers can figure out the fundamental genetic reasons that some plants do better than others in difficult conditions, those insights could become crucial for plant breeders. “Plant breeding is the art of picking winners and avoiding losers, so you have to know what to look for,” Dr. Ainsworth said. Summer 2014 marked another milestone for the Aral Sea, the once-extensive lake in Central Asia that has been shrinking markedly since the 1960s. For the first time in modern history, the eastern basin of the South Aral Sea has completely dried. In Bangladesh, increasingly severe floods – triggered, in part, by increasing temperatures and rising sea levels – are wiping out crops and destroying homes on a regular basis. In Sudan, the heat is causing the Sahara to expand and to eat into farmland, while in Siberia, the planet’s warming is causing the permafrost to melt and houses to subside. Or consider the Marshall Islands, the Pacific archipelago that is now struggling to cope with rising seas that are lapping over its streets and gardens. Even the home of the country’s president Christopher Loeak is feeling the effects. “He has had to build a wall around his house to prevent the salt water from inundating,” Tony de Brum, the islands’ foreign minister, revealed recently. “Our airport retaining wall that keeps the saltwater out of the landing strip has also been breached. Even our graveyards are also being undermined – coffins and bodies are being dug out from the seashore.” Across the planet, it is getting harder and harder to find shelter from the storm. And things are only likely to get worse, say researchers…. In its latest report, the Intergovernmental Panel on Climate Change estimates that up to 139 million people could face food shortages at least once a decade by 2070. Perhaps most alarming of all the forecasts that concern the future warming of our planet is the work of Camilo Mora at the University of Hawaii. 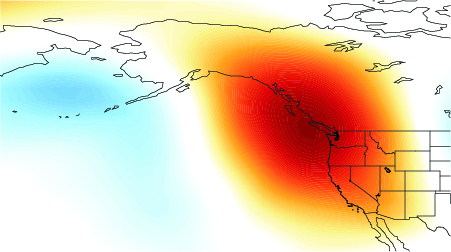 His research – which involved using a range of climate models to predict temperatures on a grid that covered the globe – suggests that by 2047 the planet’s climate systems will have changed to such an extent that the coldest years then will be warmer than even the hottest years that were experienced at any time in the 20th century. “Go back in your life to think about the hottest, most traumatic event you have experienced,” Mora said in an interview with the New York Times recently. “What we are saying is that very soon, that event is going to become the norm.” In other words, our species – which is already assailed by the impact of mild global warming – is now plunging headlong into an overheated future for which there are no recorded precedents. political psychology October 1, 2014 11:25 a.m.
Last week’s People’s Climate March drew 400,000 people onto the streets of Manhattan and a great deal of international attention to a subject of dire urgency. But some were skeptical about the event’s overall significance. “The march slogan was, ‘to change everything, we need everyone,’ which is telling, because it won’t change everything, because it didn’t include everyone,” wrote David Roberts of Grist. “Specifically, it won’t change American politics because it didn’t include conservatives.” True enough. If there weren’t such a stark divide between American conservatives and almost everyone else on the question of the existence and importance of climate change — a divide that can approach 40 points on some polling questions — the political situation would be very different. So if any progress on climate change is going to be made through the American political system — apart from executive orders by Democratic presidents — it is going to have to somehow involve convincing a lot of conservatives that yes, climate change is a threat to civilization. How do you do that? The answer has more to do with psychology than politics. The practice of tailoring a political message to a particular group is commonplace, of course. But the climate activist community has broadly failed to understand just how differently conservatives and liberals see the world on certain issues, and, as a result, just how radically different messages targeting conservatives should look. “Although climate scientists update, appropriately, their models after ten years of evidence, climate-science communicators haven’t,” said Dan Kahan, a professor of law and psychology at Yale who studies how people respond to information challenging their beliefs. Luckily, social and political psychologists are on the case. “I think there’s an emerging science of how we should talk about this if we’re going to be effective at getting any sort of movement,” said Robb Willer, a sociologist at Stanford. It’s worth pointing out, of course, that for many conservatives (and liberals), the current debate about climate change isn’t really about competing piles of evidence or about facts at all — it’s about identity. Climate change has come to serve as shorthand for which side you’re on, and conservatives tend to be deeply averse to what climate crusaders represent (or what they think they represent). “The thing most likely to make it hard to sway somebody is that you’re trying to sway them,” said Kahan. (CBS SF) — Put it in the books–Tuesday ends the 2014 record-keeping period for water watchers, and it’s the driest year since 1977, and the worst possible conditions in the history of California. Wildfires, lakes turned into barren wastelands, countless acres of decimated farmland, at least a dozen communities running out of water within days, and massive fish kills are just the beginning, as the short-term climate shows no signs of a return of moisture. “The immediate certainty is that day-to-day conservation – wise, sparing use of water – is essential as we face the possibility of a fourth dry winter,” said Department of Water Resources Director Mark Cowin…. The resistance of forests to drought has been studied, with a focus on the diversity of tree species. This study shows that mixed species forests are more resistant to drought stress than monocultures in some regions only: tree diversity may afford resistance to drought stress only in drought-prone areas, i.e. in regions where the frequency and severity of drought during the growing season is high…..
A note from the author This special update is a little different from what I typically post on the California Weather Blog. In the paragraphs below, I discuss results from and context for a study that my colleagues and I recently published in a special issue of the Bulletin of the American Meteorological Society (Swain et al. 2014). Unlike the majority of content on this blog, this report has undergone scientific peer review—an important distinction to make in the science blogosphere—and claims made on the basis of our peer-reviewed findings are marked with an asterisk (*) throughout this post. A reference list is provided at the end of the post, and the full BAMS report is available here. I would like to thank my co-authors—Michael Tsiang, Matz Haugen, Deepti Singh, Allison Charland, Bala Rajaratnam, and Noah Diffenbaugh—all of whom played critical roles in bringing this paper together. California is currently experiencing its third consecutive year of unusually dry conditions, but the intensity of California’s long-term drought has increased dramatically over the past 18 months. 2013 was the driest calendar year in at least 119 years of record keeping—but even more impressively, the current drought now encompasses the driest consecutive 12-month period since at least 1895. 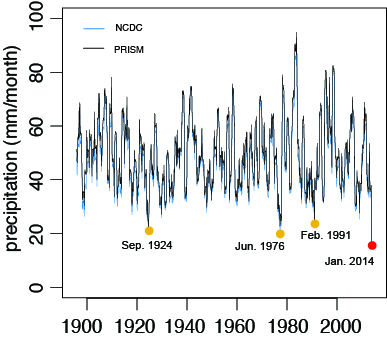 * This means that the maximum 12-month magnitude of the precipitation deficits in California during the current drought have exceeded those during all previous droughts in living memory—including both the 1976-1977 and 1987-1992 events. 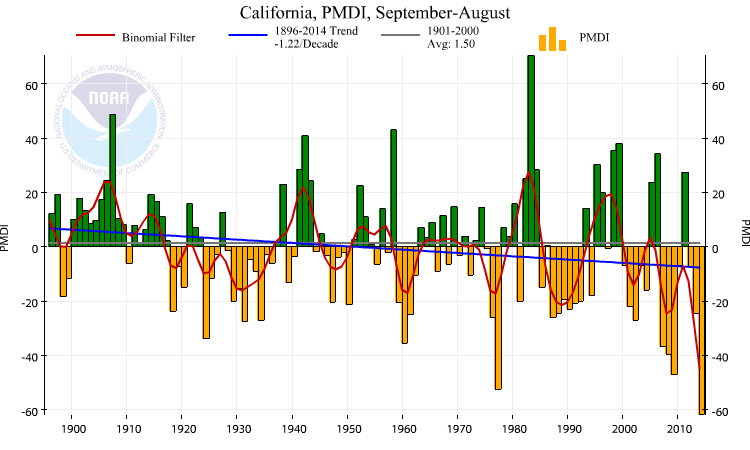 * As of September 2014, 3-year precipitation deficits now exceed average annual precipitation across most of California, and most these anomalies stem from the exceptional dryness during 2013 and early 2014. For many practical purposes, 2013 was a “year without rain” in California—an extraordinary occurrence in a region with a traditionally very well defined winter rainy season….. Play Video|2:02 Out of Water in Tulare, Ca. A community in California struggles as the water runs out. One resident has used her own money and donations from others to begin delivering water to people’s homes. Video by Jennifer Medina on Publish Date October 2, 2014. Photo by Jim Wilson/The New York Times. Due to the warming conditions, the runoff will increase in winter and decrease in spring as more precipitation falls as rain instead of snow. Reservoirs may fill earlier and excess runoff would have to be released earlier to ensure proper flood protection is maintained. This may lead to reduced storage in reservoirs when the summer irrigation season begins. Water demands are projected to increase. Urban water use is expected to increase due to population increases in the Central Valley while agricultural uses are projected to decrease because of a decline in irrigated acreage and to a lesser extent the effects of increasing carbon dioxide. Water quality may decline by the end of the century. Sea levels are predicted to rise up to 1.6 meters in that time frame which will lead to an increase in salinity in the Delta and a decline of habitat for fish and wildlife. River water temperatures may increase because cold water availability from reservoir storage would be reduced. The food web in the Delta is projected to decline. Projected lower flows through the Delta and reduced cold water due to lower reservoir levels will make less water available for species, including endangered species such as migrating salmon. Hydropower generation is projected to decline in Central Valley Project facilities due to decreased reservoir storage. However, net power usage is also expected to decline due to reductions in pumping water and conveyance. Farmers used to pour water down ditches or furrows to irrigate their vineyards, or use overhead sprinklers. Most growers have to pump water underground from wells and that can be expensive. So in San Joaquin County growers are now using a technique called regulated deficit irrigation using drip irrigation. Lodi grape grower Craig Rous says the practice has benefits beyond saving water and money. “When you deficit irrigate, in other words, when you irrigate with less water than they really need to grow, they stop growing, the quality of the wine and the juice is actually better when you do it,” says Rous. Growers are also switching to drip irrigation to reduce the costs of pumping groundwater from wells…..
It’s been called the largest alteration of the earth’s surface. In the San Joaquin Valley, since the 1920s, farmers have relied on groundwater to varying degrees, and over time, overpumping of groundwater basin has caused the land to subside – over 30 feet in some locations. In this presentation, USGS hydrologist Michelle Sneed discusses subsidence in the San Joaquin Valley, specifically along the Delta Mendota Canal, where there’s been some problems associated with subsidence, as well…. “This is Joe Poland and he’s using a telephone pole or a power pole to illustrate where the land surface was in 1925, where the sign is, 1955, and where he is standing in 1977. Almost 30 feet of land subsidence has occurred at this location during that time period.” She noted that in the picture, he is standing is southwest of Mendota, but today she would be talking about a different area, a new area where they were surprised to find subsidence occurring. “What we found were 1200 square miles subsided in the northern San Joaquin Valley area in an area bounded by Mendota on the south, Merced on the north, Madera on the east, and Los Banos on the west,” said Ms. Sneed. “The subsidence is occurring at rates ranging from about a half inch a year to almost a foot a year over a 2 year period, from 2008 to 2010.” She noted that surveys done since then by Reclamation and DWR indicate that these rates of subsidence have continued through 2013….. Hailed as the largest climate demonstration in history, the People’s Climate March is estimated to have drawn as many as 400,000 demonstrators to the streets of Manhattan yesterday. While organizers initially expected around 100,000 attendees, the crowd count hovered at around 310,000 by 3pm (the demonstrators—many sporting clever signs and witty costumes—had lined up hours before the 11:30am start time) and eventually spilled over into streets outside the official route. An anonymously submitted drone video captures the crowd congregating along the city’s West Side. But what the video doesn’t quite capture is who was at the front of the march: mainly members of indigenous communities, labor unions, and groups advocating on behalf of immigrants and the poor. These marchers, who came from across the globe, represent communities disproportionately vulnerable to the ripples of climate change, whether it’s the indigenous communities in the Canadian arctic, low-income families slammed by Hurricane Sandy, or people of color, who in the US are more likely than caucasians to live close to coal-fired power plants and breathe in polluted air. The march focused attention on environmental issues ahead of tomorrow’s United Nations climate summit, where 120 world leaders hope to come up with a global framework on how to combat the environmental crisis. UN secretary-general Ban Ki-moon attended the New York march, as did former US vice president Al Gore, New York City mayor Bill de Blasio, actors Leonardo DiCaprio and Edward Norton, and other widely recognized activists. According to the organizers, more than 2,800 solidarity events were held in 166 countries across the globe, in cities including London, Paris, Istanbul, Jakarta, and Melbourne. New York Gov. Andrew Cuomo signed legislation yesterday requiring state agencies to assess the risks of climate change when approving projects like updates of wastewater treatment plants. The law also calls for official projections of sea-level rise to help inform development decisions. The Community Risk and Resiliency Act calls for new standards for rising seas, storm surges and flooding that state officials must use when issuing some major permits or approving funding for a range of projects, including large water infrastructure systems, local parks, waterfront revitalization efforts and coastal rehabilitation work…..
Summary: The New York bill (Senate Bill 6617), called the “Community Risk Reduction and Resiliency Act” and sponsored by Democratic state Sen. Diane and Assemblyman Robert Sweeney, amends the state’s existing environmental conservation, agriculture and market, and public health laws to require consideration of the effects of climate change and extreme weather events before issuing state permits and allocating infrastructure funds (including grants to NGOs for conservation work). The purpose of the bill is to amend certain New York legislation to reflect greater awareness and preparedness for climate change associated risks such as sea level rise and flooding. The bill represents one of the first state efforts in the country to incorporate climate change preparedness into official legislation and is an optimistic indicator of growing climate change awareness. Importantly, it requires the Department of State (DOS) to work with the Department of Environmental Conservation (DEC) to develop resiliency guidance that utilizes natural resources and natural processes to reduce risk. It also reaches the local level by requiring DOS to prepare model local zoning laws that include climate risk analysis and make these laws available to municipalities. New York state agencies are required to consider the future likelihood of extreme weather in their decisions on public works projects, industrial and commercial permits and regulations, according to a new law signed this week. Applications for the first round are due October 27, 2014. On October 1, the Obama administration launched the first round of its Climate Action Champions Competition, a new effort to recognize and support the path-breaking steps that local and tribal governments are already taking to reduce carbon pollution and prepare for the impacts of climate change.The competition, administered by the U.S. Department of Energy, will identify 10-15 communities across the country that have proven themselves to be climate leaders by pursuing ambitious climate action on both tracks: reducing greenhouse gas emissions and building climate resilience. In addition to earning the Climate Action Champions designation, the selected communities will benefit from facilitated peer-to-peer learning and mentorship, along with targeted support and technical assistance from a range of federal programs. They will also become part of a broader network of efforts to address and prepare for climate change. Depending on the needs of the communities selected as Champions, competition winners may receive tailored climate data and tools, technical assistance to facilitate climate-smart community planning, access to extreme-weather preparedness exercises run by the Federal Emergency Management Administration, and assistance in accelerating solar energy deployment through DOE, among other benefits. Each of the Champion communities will also be assigned a coordinator to help identify financial and technical assistance opportunities for their preferred climate strategies. This first round of the competition seeks to select a diverse set of communities that are already leaders in addressing and preparing for climate change. The next round will look for communities that have demonstrated substantial commitment and motivation to take on the climate challenge, but may have lacked sufficient resources to make ambitious investments. The pioneering Champions will mentor and share lessons learned with the communities selected in the second round, helping them to leapfrog over some common implementation challenges and creating a model for future Champions to follow. For more information on the competition, see the White House blog post, and the Request for Applications. Fresh from a closed-door meeting with Chinese Vice Premier Zhang Gaoli, President Barack Obama called on other nations Tuesday to join the United States in confronting climate change, saying U.S. cuts to greenhouse gas pollution are bearing fruit but cannot accomplish the goal alone. “Yes this is hard, but there should be no question that the United States of America is stepping up to the plate,” Obama said in a 14-minute address to the United Nations during a climate summit that saw world leaders pledge to take action while some developing nations’ representatives chided the West for doing too little. “We recognize our role in creating this problem. We embrace our responsibility to combat it. We will do our part, and we will help developing nations do theirs. World leaders need to stay focused on the climate threat and “look beyond the swarm of current events,” Obama added less than a day after the U.S. and its Arab allies launched military strikes on ISIL forces in Syria…. President Barack Obama will announce the new executive order during a speech before more than 120 world leaders at the U.N. climate summit in New York City….. The major oil companies in the U.S. have not had to pay a price for the contribution their products make to climate change. But internal accounting by the companies, along with a host of other signs, suggest that may soon change — though the implications of a price on carbon are far from clear. In the winter of 2013, after mounting pressure from shareholder groups who wanted to understand the impacts of any future climate legislation, the biggest U.S.-based oil companies were nudged into a surprising revelation: ‘Carbon,’ the stand-in for carbon dioxide and all other greenhouse gases, had been given a price in the companies’ internal accounting. The externalized and largely uncounted costs long associated with fossil fuels — 20 pounds of CO2 emitted with every gallon of gasoline, according to the EPA — were now being given a number. At the time, the biggest of the oil majors, ExxonMobil, reported a carbon price of $60 per metric ton to the Carbon Disclosure Project, which released the figures. Chevron, BP, and Royal Dutch Shell reported a price of up to $46 per ton, and for the first time, the oil majors appeared to be lifting the lid on the accounting sleights of hand that have kept the full costs of oil hidden from public view…. Alan Jeffers, ExxonMobil’s chief media officer, explains that the company’s pricing of carbon is “a proxy price reflecting all the action the government could take to regulate the exploration, transport, and processing of carbon fuels.” In other words, it rises and falls based on a perception of political and public pressure for restrictions on carbon emissions. Jeffers said that ExxonMobil has been calculating an internal carbon price since 2007, when it was far lower than it is today. The price, Jeffers said, was raised in 2009 when Congress looked likely to impose a cost on carbon through cap and trade, and it declined afterward. Now it’s up again, he explained, reflecting the combination of forces impacting the risks and costs that oil faces in the marketplace: tightened mileage standards by the EPA; renewable fuel standards in California and other states; the talk from President Obama, the World Bank, and others about a coming price for carbon; and rising public pressure for action on the climate….Under most scenarios, the consumer will end up paying any carbon fees because the higher costs will be passed down to them at the pump. This is why what the government does with the revenue generated from carbon pricing is so important. If it is delivered back to consumers in the form of a rebate, or used to build better public transportation and fund research into cleaner energy sources, such revenues could offer significant public benefits. In addition, a price as low as $60 or $80 dollars a ton could begin tilting people away from oil to other forms of energy. If drivers start switching to electric vehicles, for example, it will matter a great deal for Exxon’s bottom line whether those electrons are coming from natural gas, in which Exxon has also invested heavily, or wind and solar, a sector where Exxon and other major oil companies so far have little footing. For now, however, Exxon doesn’t see that as a realistic outcome. From its point of view, the company’s market share remains steady with a price for carbon at $60 or $80 per ton because, as Jeffers puts it, “Our forecasts suggest there is no viable alternative to oil.” The challenge from a climate perspective, of course, is proving him wrong. Looking to build climate resilience through your local or State Hazard Mitigation Plan? This could be the first step. The Federal Emergency Management Agency (FEMA) continues to work to update the “State Multi-Hazard Mitigation Planning Guidance.” Their new Highlights of Key Concepts is available for public comment. The recommendations include strengthening specific requirements for assessing future risk in light of a changing climate and changes in land use and development. This will ensure that the mitigation strategy addresses risks and takes into consideration possible future conditions in order to identify, prioritize, and implement actions to increase statewide resilience…. We are thrilled to report that Governor Jerry Brown has signed into law Assembly Bill (AB) 2193, establishing a simplified permitting process that accelerates small-scale, voluntary habitat restoration projects across California through the Department of Fish and Wildlife. Sponsored by Sustainable Conservation and authored by Assemblyman Richard Gordon (D-Menlo Park), AB 2193 establishes a simplified, cost saving permitting process, which removes a major barrier to implementing restoration projects. The bill empowers landowners, government agencies and conservation organizations to improve California’s habitat for endangered species, reduce sediment and pollution in waterways, restore fish habitat, and increase vegetation in riparian corridors. The bill’s nearly 50 supporters, ranging from scientific groups to environmental organizations to resource conservation districts across the state, underscores just how much progress can be made when we all unite to make California thrive. In the end, AB 2193 passed through the entire legislative process without a single “no” vote. Stay tuned for our official press release by refreshing Sustainable Conservation’s new blog. A federal judge restored Endangered Species Act protection for wolves in Wyoming on Tuesday, ruling that the federal Fish and Wildlife Service accepted a state commitment to maintain the wolf population without requiring adequate safeguards. The state’s wolf-management plan declared the wolf a trophy-game animal, allowing seasonal hunting in some areas, and labeled it a predator that could be shot in four-fifths of the state. In United States District Court in Washington, Judge Amy Berman Jackson ruled that the wildlife service’s judgment that the wolf was no longer imperiled in much of its range was reasonable. She also deferred to the wildlife service’s judgment that the wolf was not unduly threatened by Wyoming’s decision to brand it a predator, noting that its numbers were small or nonexistent in much of the area covered by that designation. But she said that the state’s management plan was inadequate and unenforceable and that federal officials were “arbitrary and capricious” in accepting it. Her ruling requires that the wolves remain under federal protection until Wyoming officials devise an enforceable proposal to maintain their numbers. Bonnie Rice, a senior representative for the Sierra Club’s Wild America campaign, said Judge Berman’s ruling recognized that Wyoming’s management plan had “very big flaws.” “We think the court is right to require them to develop a plan that’s more science-based and doesn’t treat wolves as vermin in the majority of the state,” she said….. The USDA Natural Resources Conservation Service (NRCS) has selected three California organizations to receive national Conservation Innovation Grant (CIG) awards for 2014. “Conservation Innovation Grants provide organizations financial resources to create and implement innovative programs or practices that benefit conservation-minded farmers and ranchers,” said Carlos Suarez, state conservationist for NRCS in California. – The Western Riverside County Agricultural Coalition (WRCAC) will receive $200,000 to determine if local farmers would benefit from trading water quality credits within a Water Quality Trading (WQT) program. – The Regents of the University of California will receive $230,000 to support a farmer-initiated effort for monitoring and evaluating pollinator habitat, and educating and engaging agricultural producers in pollinator conservation. – The California Dairy Research Foundation will receive $73,000 to develop, field-test and demonstrate the use of an electronically available teaching and learning (eLearning) system as an innovative approach to conservation-practice adoption and nutrient management implementation. In addition to funding these three state projects, California will benefit from a multi-state grant to help rice growers achieve and verify greenhouse gas emissions reductions, using low emission rice practices in their fields. NRCS administers both a national and a state-level CIG program to fund the development of unique and innovative solutions that will make natural resources conservation more effective and efficient. State level grants will be announced soon. For a full list of CIG award winners click here. Different strategies used by states to reduce power plant emissions — direct ones such as emission caps and indirect ones like encouraging renewable energy — are both effective, a study has found. The study is the first analysis of its kind, the authors report. The plan is expected to reduce greenhouse gas emissions from buildings by the equivalent of about 3.4 million metric tons of carbon dioxide…..
Calif. Gov. Jerry Brown honored pioneering climate scientist Stephen Schneider posthumously by inducting him into the California Hall of Fame on Oct. 1. Schneider, one of eight inductees this year, died in 2010. He was the Melvin and Joan Lane Professor for Interdisciplinary Environmental Studies and a senior fellow at the Stanford Woods Institute. Praising Schneider for being one of the earliest people to warn about climate change, Brown placed him “in the grand tradition of California scientists who have used their talents and training to tame society’s greatest challenges.” “Just from the general controversies around climate change, you can appreciate what it took for him to pursue his science,” Brown said during the ceremony, which was recorded and can be viewed on YouTube (comments re: Schneider begin at 6:12). As pictures from Schneider’s life appeared in the background, Brown noted Schneider’s many accomplishments, including advising the administration of every president from Richard Nixon to Barack Obama. “I don’t know if they all listened to him,” Brown joked. Brown also shared his memory of testifying with Schneider before the U.S. Environmental Protection Agency about a law to introduce stricter tailpipe emission standards in California. “I was attorney general and he was the expert,” Brown recalled. “And it was just something to behold, of not only does he have the scientific knowledge and the expertise, but he made complicated stuff appear to be very understandable, very powerful.” Schneider’s widow, Woods Senior Fellow Terry Root (Biology, by courtesy), accepted the Spirit of California medal on Schneider’s behalf. In an emotional speech, she thanked Brown “for honoring my late husband, and for the tireless work that you have done to actually combat climate change. “Like you, Steve fought hard for what he understood to be true,” Root said, “and worked equally as hard to help the public understand the facts of climate change.” The Sacramento Bee has assembled a photo slideshow from the event. Terry Root talks accepts the Spirit of California medal on behalf of her late husband environmental scientist Stephen Schneider from Gov. Jerry Brown during the 8th Annual California Hall of Fame on Wednesday, Oct. 1, 2014 in Sacramento, Calif.
MIT: Global energy use, CO2 may double by 2100. Even as curbing greenhouse gas emissions becomes more urgent as the effects of climate change become more acute, fossil fuels will remain the largest source of GHGs far into the 21st Century as both global energy use and CO2 emissions double, according to MIT’s 2014 Climate and Energy Outlook…. Desert land management plan seeks to strike a balance between environment, renewable energy Much of Southern California desert and inland valleys is allocated for solar, wind and geothermal development With towering white wind turbines turning slowly in the background, U.S. Interior Secretary Sally Jewell on Tuesday unveiled a plan to manage both conservation and renewable energy production on more than 22 million acres in California — nearly one-quarter of the state — as part of a federal and state effort to promote clean energy production. The Desert Renewable Energy and Conservation Plan, which Jewell called unprecedented, has been five years in the making. It carves out most of the Southern California desert and inland valleys for large-scale solar, wind and geothermal development and identifies reserve areas where protecting the land and animals that inhabit it will trump energy development. Few environmental groups had read the 8,000-page document, which is still in draft form, before its release, and many praised it as a good start. Others, though, said they worried that the plan provided too much leeway for developers to continue projects in environmentally sensitive areas…. Think of it as a Goodyear blimp for the era of alternative power – a kind of giant tubular helium balloon with a three-bladed turbine inside, floating as much as 2,000 feet in the air so it can capture energy from winds that blow stronger and more steadily than they do at ground level…. Using a bio-mimicking analog of one of nature’s most efficient light-harvesting structures, blades of grass, an international research team has taken a major step in developing long-sought polymer architecture to boost power-conversion efficiency of light to electricity for use in electronic devices. An analysis by HSBC suggests a solar-plus-battery home system will be cheaper than grid power in Germany within a few years. And everyone else may not be far behind…..
Across the country, government agencies, partners, and stakeholders are taking action to prepare for and respond to the impacts of a changing climate. Taking Action, a progress report highlights 50 case studies that demonstrate implementation of the many climate change adaptation actions recommended in the National Fish, Wildlife, & Plants Climate Adaptation Strategy. On Saturday night, crowds descended upon the United Nations Headquarters in New York City as we lit up the UN with 39-story images in a first-of-its-kind event: illUmiNations, Protecting Our Planet. Why? To put a spotlight on the biggest problem facing humanity today: the mass extinction of species. The projections we displayed of endangered species, deteriorating coral reefs, and threatened habitats, were nothing short of spectacular. Jaws dropped. Traffic stopped. People were in awe. You can watch the highlights now by CLICKING HERE. They are common suggestions to remedy stress: You just need a breath of fresh air. Walk it off. Get out and see people. Turns out all those things combined may in fact make you feel better — a lot better — a new large scale study suggests. After a long stay in the Intensive Care Unit only a handful of pathogenic microbe species remain behind in patients’ intestines, a study has shown. The team of researchers tested these remaining pathogens and discovered that some can become deadly when provoked by conditions that mimic the body’s stress response to illness. New research focused on mental wellbeing found that high and low mental wellbeing were consistently associated with an individual’s fruit and vegetable consumption. 33.5% of respondents with high mental wellbeing ate five or more portions of fruit and vegetables a day, compared with only 6.8% who ate less than one portion. Oleate, a common dietary fat found in olive oil, restored proper metabolism of fuel in an animal model of heart failure, researchers report. Heart failure affects nearly 5 million Americans, and more than half a million new cases are diagnosed each year. Heart failure is not the same as having a heart attack — it is a chronic disease state where the heart becomes enlarged, or hypertrophic, in response to chronic high blood pressure which requires it to work harder to pump blood. In the first, small study of a novel, personalized and comprehensive program to reverse memory loss, nine of 10 participants displayed subjective or objective improvement in their memories beginning within three to six months after the program’s start. The study, which comes jointly from the UCLA Mary S. Easton Center for Alzheimer’s Disease Research and the Buck Institute for Research on Aging, is the first to suggest that memory loss in patients may be reversed, and improvement sustained, using a complex, 36-point therapeutic program that involves comprehensive changes in diet, brain stimulation, exercise, optimization of sleep, specific pharmaceuticals and vitamins, and multiple additional steps that affect brain chemistry. The findings, published in the current online edition of the journal Aging, “are very encouraging. However, at the current time the results are anecdotal, and therefore a more extensive, controlled clinical trial is warranted,” said Dale Bredesen, the Augustus Rose Professor of Neurology and Director of the Easton Center at UCLA, a professor at the Buck Institute, and the author of the paper…. There’s an old saying: “Don’t drink the water.” But a scientist warns Americans not to drink water from plastic bottles if it’s been sitting in a warm environment for a long time. A research team examined 16 bottled water brands at 158 degrees for four weeks. The study found that as bottles warmed over the four-week period, antimony and BPA levels increased. While American pediatricians warn sleep deprivation can stack the deck against teenagers, a new study reveals youth’s irritability and laziness aren’t down to attitude problems but lack of sleep. This paper exposes the negative consequences of sleep deprivation caused by early school bells, and shows that altering education times not only perks up teens’ mood, but also enhances learning and health. The use of broad-spectrum antibiotics by children before the age of 24 months was associated with increased risk of obesity in early childhood, a study concludes. The authors used electronic health records spanning from 2001 to 2013 from a network of primary care clinics. All children with annual visits at ages 0 to 23 months, as well as one or more visit at ages 24 to 59 months were enrolled. The final group included 64,580 children. Children were followed-up until they were 5 years old. What do you know about tarantulas in California? Which of the following statements are true?